Hanging together or hanging separately – Escape Reality, Read Fiction! I’ve said this before, I am a Librarian. I read Karen Schneider’s post at Free Range Librarian about a speech made by Jeff Trzeciak, the University Librarian at McMaster’s University in Canada. My reaction to the post was to go “Spot on, Karen!”, and then to sit through the speech. Wading past the opening, self-congratulatory section of the speech, as I focused on the purport of Trzeciak was really saying, I realized something really quickly. I’ve heard this speech before. Not the exact details–but the gist–out of the mouths of public library directors. This is the “Tree of Libraries are Doomed” speech. “Libraries are Doomed” unless “visionary” directors make radical changes that pointedly do not include librarians. An equally insidious branch of this tree has sprouted in public libraries, among directors who seem to be using the current economic crisis to devalue and de-professionalize libraries and librarians, instead of recognizing that it is our expertise that will make us relevant in the years to come. 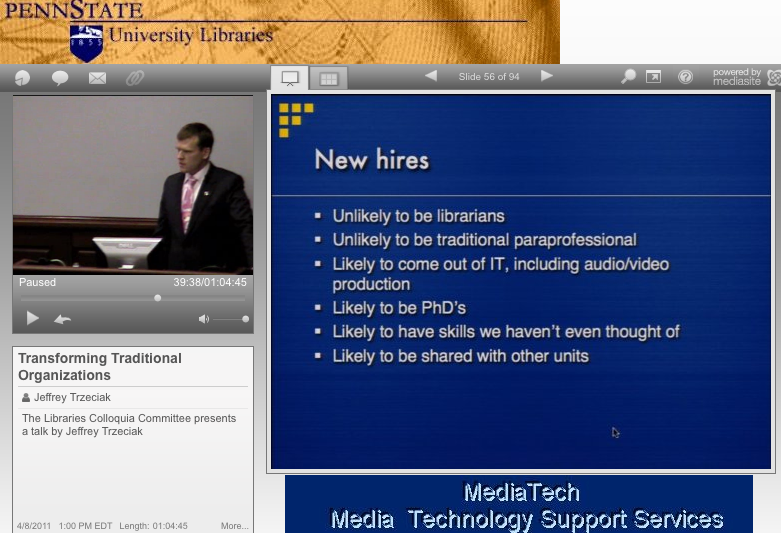 The only differences between what Mr. Trzeciak proposed for McMasters and what is happening right now in public libraries is that public libraries are creating positions more generically for degrees other than the MLS rather than just PhDs and public libraries don’t generally have the option of creating positions specifically for post-doc appointments. Otherwise, everything on this slide applies to public libraries as well. Whenever I hear the variations of this speech, I hear a librarian who wants to say he is different from all the other librarians, and that the way he is going to set himself apart is providing new, edgy services. And that the other librarians are not capable of providing those wonderful new, visionary services, that only other professions are capable, so he’ll hire staff from those professions into new positions, so he can re-write the job descriptions and get around any institutional regulations that would normally require him to hire librarians or even to retain librarians currently in place. But traditional library services, what few are needed, like direct public service, are not really professional work according to this mantra, and should be de-valued and performed by trained paraprofessionals who will get slightly more pay (hopefully) to handle patron facing services where every library of every type needs to put its best and its brightest. But thinking that all the library needs to provide good readers’ advisory services are the shelving staff because they know which books get used most is not the way to go. Do libraries, all libraries, need to change in response both to economics and technology? Yes! Should we examine, and possibly change, the mix of staff that libraries hire in response to those changes? Yes, we should. Are librarians capable of making the changes needed and providing cutting edge services and even getting out in front of change? Hell yes! This is a case where the quote from Benjamin Franklin comes to mind, “We must, indeed, all hang together, or, most assuredly, we shall all hang separately.” This school of thought, that only other people can make libraries relevant in the future, is deadly for the profession, for the public, and for the institutions that we serve. If Borges is right, and “Paradise will be a type of library”, it will be because of librarians and the service ethic that we work by. Goodreads or Library Thing or Shelfari??? What could Abraham Lincoln and Elizabeth Tudor possibly have in common? Pingback: Re:Generations » Blog Archive » Professional future tense. I would like to respond to the comment about paraprofessionals and “shelving staff” providing readers advisory services. There is a long time tradition of library staff coming not from a degree – but from an apprenticeship that trained staff in all services of the library – which leads to a huge breadth of knowledge. Secondly, almost all paraprofessionals today are trained in instructional services, database searching, IT help, reference resources and resource evaluation among other areas of study. These professionals will refer to a subject specialist librarian if the questions are beyond their own ability. However, librarians at a reference desk will also refer or consult on a question that goes beyond what they can do to a subject or program specialist – this is just good library practice. Paraprofessionals are not intended to replace librarians but to work with them to expand the reach of their programs and their libraries. I agree with absolutely everything you said. My point was that in the scenario of doom, there are some administrators who believe that no librarians are necessary to perform direct patron service. And there was a specific example from a FPOW where the director believed that only shelving staff were necessary to handle readers’ advisory. Neither librarians nor paraprofessional staff were needed to perform this core service, in this particular administrator’s view. I think there is a big difference between having everyone in the library at every level feel empowered to assist patrons (I have worked in places that went the other way, too), and the current trends that take the librarians out of the library staffing mix.